« And Yannna Does It Again – In Under FORTY EIGHT HOURS Two Brand New Hairs Are Pirated As ‘Retextures’! Two hours into the new year (or at least out in California…) and it doesn’t look like it’s going to be any more of a happy new year for those who foolishly invested their hope and money on Sims 4. 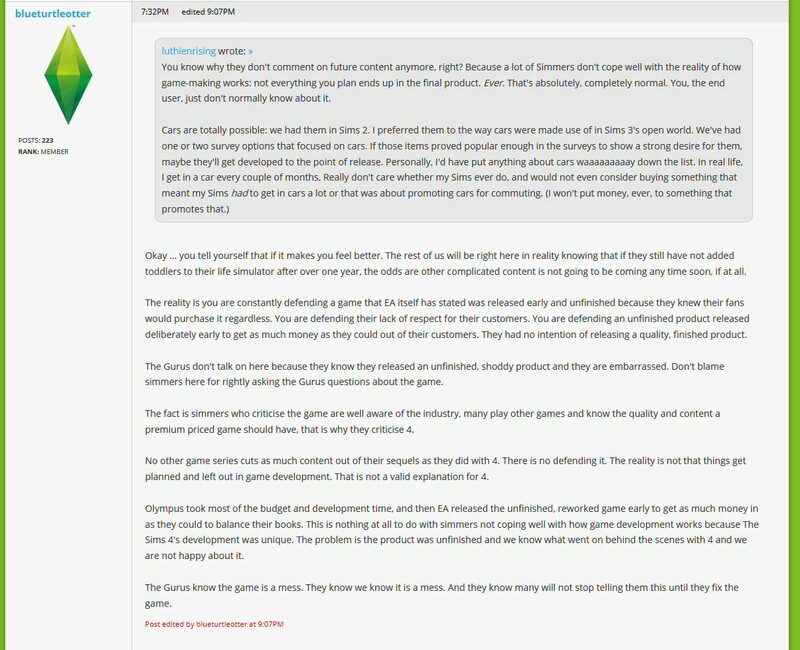 For those of you who require reminding, here it is straight from the bumnugget’s mouth written on 23rd September 2013. Simified has since scrubbed the interview off in accordance with EA’s diktats to its pet toadies. Unfortunately for EA, we are far from being one of their pet toadies and ergo it will remain up here until Doomsday. For LoveMcQueen5683 – who only joined in May last year – this was a new revelation about the extent to which Grant Rodiek and the rest told Simmers what they wanted to hear in order to get them on board with the base game. Of course, with loading screens most accepted it would be in the same limited format as Sims 2, but equally they accepted they would at least be base game! When ‘things change’ NZsimm3r, would you not equally accept that the onus is on those providing the inaccurate information to clarify and update accordingly before release day, that caveat emptor is an unacceptable manner for a gaming company to treat its loyal customers? 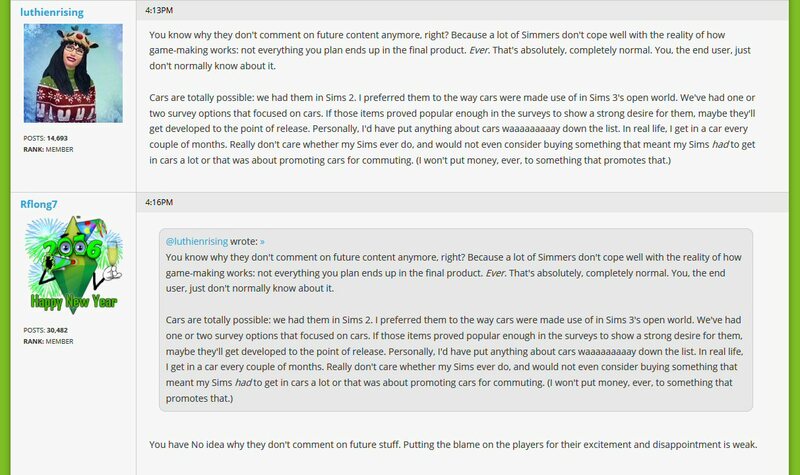 As LoveMcQueen5683 says, they lied – or at least indulged in ‘truth economics’ – whereas Simfan923 reacted the way Sims 4 are wont to do whenever an unpalatable truth is uttered – deflect, deflect, deflect. You go back along the thread posts, look for the long gap in the timeline between two posts, and voila! Not exactly rocket science, is it? So easy, even a Sims 4 player can understand it. 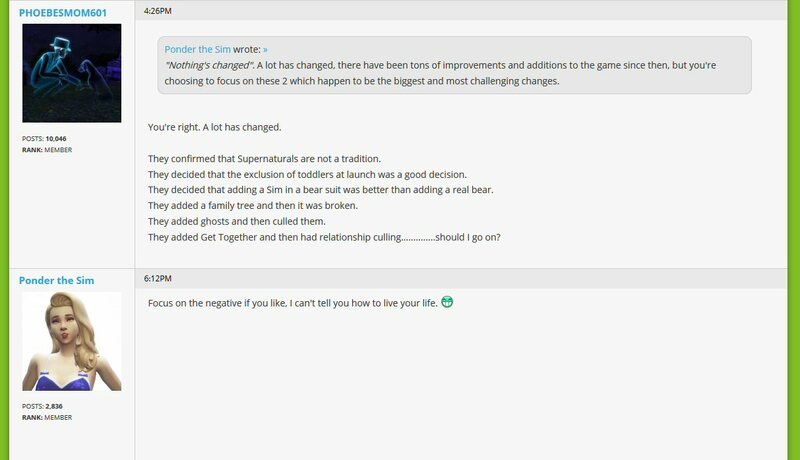 But whilst the likes of the above and KevWalker were all for burying bad news, at least some who went over to the Pastel Side like the much missed in Sims 3 quarters ElanorBreton saw the funny side. LuthianRising was the next apologist and excuse maker – and her two paragraphs of waffle were shot down brilliantly by two sentences of Rflong7/13. Luthianrising was not best pleased. Better watch out Rflong7/13 – that’ll be you having another hate post in Sim Secret with lots of big grown up swear words attached to it! ‘But call me whatever you like’? Hmmm, Rflong7/13 never called you anything? Is that someone’s guilty conscience speaking – judging others by her own standards of behaviour? So what’s happened between now and then, Luthianrising? 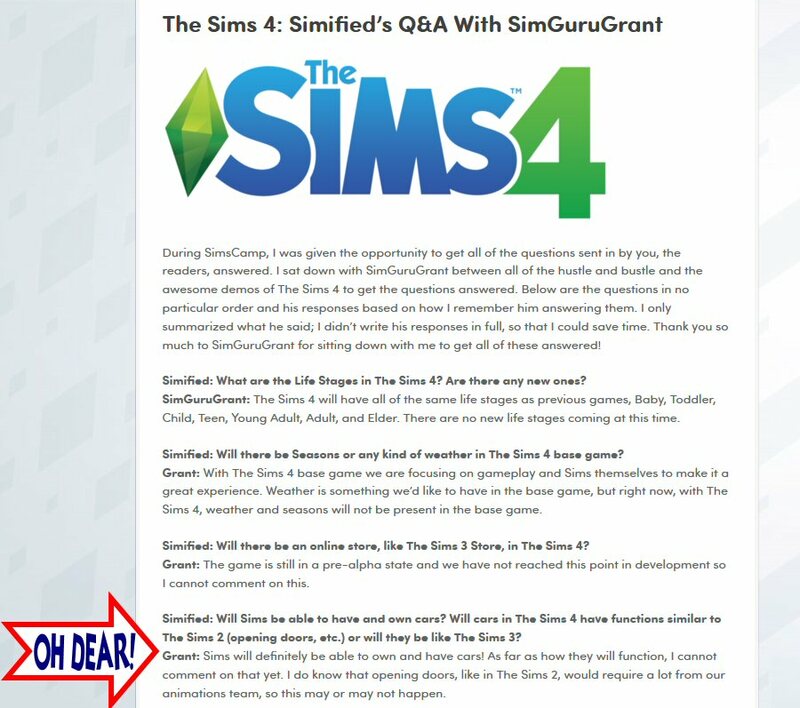 Did some Simguru buy you a lollipop? Phoebesmom601 met much of the same when she pulled up PonderTheSims’ ludicrous fallacies… ‘challenging changes’ indeed! But as LoveMcQueen6583 says, they have your money, and all you have is the knowledge of being had! This entry was posted on January 1, 2016 at 11:58 pm and is filed under Uncategorized. You can follow any responses to this entry through the RSS 2.0 feed. Both comments and pings are currently closed.